Rachael Miles, 36, has rosacea, a common long-term and poorly-understood skin condition that mainly affects the face. She started experiencing symptoms, which include flushing, burning and spots, after a particularly traumatic break up. The Glasgow-based civil servant revealed how discovering her partner of three years had been cheating on her last Christmas triggered the condition. “As my world collapsed my skin literally erupted into a furious red lumpy mess, which I later discovered was rosacea,” she told Express.co.uk. As the single mother of two was reeling from the shock of how a man who she thought was ‘the one’ was actually a compulsive liar, the grief and anxiety manifested itself on her skin. “It started with lots of little red lumps and then it just erupted into a burning red agony,” she said. Rachael visited her doctor who prescribed her with a topical steroid, Eumovate, which is actually for eczema, another skin condition. Instead of soothing her rosacea it caused it to flare-up further instead. She returned to her GP again and was given more steroids and lotions that all had a similar effect. As the months went by her confidence took a knock, and she stopped socialising and gave up her favourite hobby, walking in the windy Scottish countryside which exacerbated her symptoms. “I hit rock bottom when I was invited to a leaving do for a work colleague,” she recalled. “I didn’t want to go but she was a friend and I felt awful saying no. I tried to muster all my courage and bought tons of make-up even though I knew it was going to be agony when I put it on. “Before the night had even begun I found myself in the pub toilet sobbing my eyes out. I was in such agony because the cosmetics burned my skin and were literally running off my face with this furious raging bumpy skin poking through the bare patches. “I felt hideous. In the end I just had to leave as I couldn’t bear to face people. While on a three-month waiting list to see a skin specialist - and becoming increasing king worried her complexion would never clear up - she began to research online. It was during one of these searches that Rachael stumbled upon Kalme caper products (www.kalme.co.uk), recommended by someone on a rosacea support group website. As well as being moisturising and reducing sensitivity, they have an anti-inflammatory and redness-reducing effect. “They were the first products I had put on that did not burn when I applied them,” she explained. 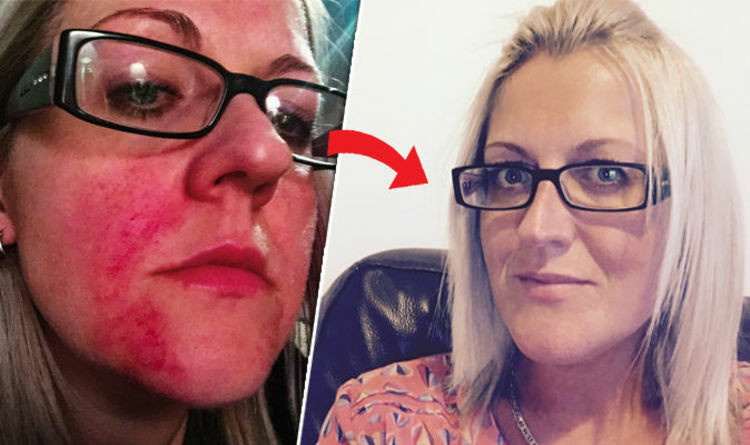 She began applying the products - which are currently priced from £9.95 - to her skin three times a day, and it took just three months for her skin to return to normal. “I felt empowered. It changed my whole outlook. It felt like the first thing I was able to finally control and conquer since the break-up,” she said. “Now I no longer fear people looking at me. I guess it felt like my skin was telling everyone what a mess I was inside. That makes you feel very vulnerable. “Skin conditions are too often overlooked by doctors as something not that serious, but if you listen to how people with skin conditions really feel, it’s actually a far more serious matter than people realise, particularly if its accompanied or caused by emotional turmoil. The combination of the two can be truly devastating. Rachael has now started a new relationship and returned to university to begin a psychology degree.